I'm very honoured to have two of my original artpieces in the current L'art et l'automobile auction. Mister Jacques Vaucher's auctions are world renowned and respected for the quality and scope of the lots. 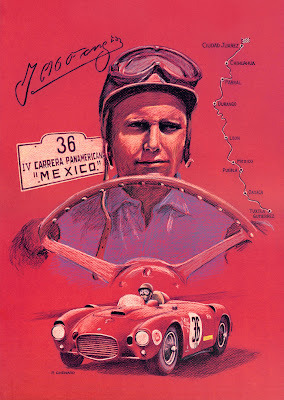 Prismacolor pencils of red archival paper, 13" x 19.75"
My portrait of Juan Manuel Fangio and his win of the 1953 La Cerrara Panamericana in a Lancia D24 and my representation of Sir Stirling Moss' win of the 1959 Nurburgring 1000 km in an Aston Martin DBR1 are the two pieces represented. Prismaclor pencils on gray archival stock, 18" x 7"
and the aston is a classic! Thanks, Rob, it's certainly exciting. I hope someone wants the art!